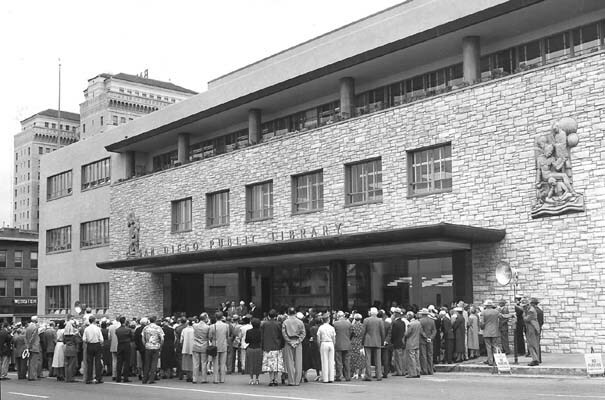 San Diego Public Library opens, 1954. Library supporters are urging citizens and staff to attend one of these meetings, and want many library supporters at each district hearing, and especially want a strong library presence on Feb 4. Organizers say If there is no hearing scheduled in your district, please consider attending that meeting. 1. Bring a sign that says “LIBRARY SERVICES ARE ESSENTIAL! Branch Libraries- ESSENTIAL; Main library- ESSENTIAL; Library Youth Programs- ESSENTIAL NO MORE LIBRARY CUTS” This sign reflects the survey choices for libraries and reinforces our message of no more library cuts. 4. Make and distribute a handout to your neighbors who are also attending the hearing who are perhaps present because of a different issue. Libraries should be everyone’s issue. Our audience is not only the council but our community members. Anna reminds us that “If you’re not at the table, you’re on the menu.” And that we were successful last November in avoiding library closures, and we can make a difference again. Budget & Finance Committee Chair Tony Young has scheduled meetings to solicit public input in preparation for the FY10 City budget. Most City departments have been asked to present the Mayor with budgets that show 15% cuts for FY10 (compared to the 10% budget cuts that were sought in the mid-term FY09 budget adjustments). The February meetings will help the Committee prioritize City services as they consider budget cuts. For background from the Independent Budget Analyst on this process, visit here. Any cuts in Library services, hours or resources is unacceptable. Library services are needed now more than ever with circulation up nearly 13 percent in December alone (versus December of last year). All Library services are essential. 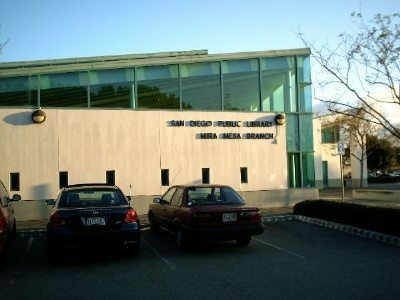 The Friends of the San Diego Public Library strongly support the library system. This includes our neighborhood libraries and the central library. Despite the bad news – I love that slogan: if you’re not at the table, you’re on the menu! Please get out there and do what you can! The city employees have had a hard time knowing what they can and can not say without jeopardizing their jobs. So that means that you… the people… are so very ESSENTIAL to keeping our libraries and parks and all other essential services from getting tanked! Hurray for the OB Rag!! Organize carpool to the hearings! Great way to get to know your neighbors. The OB Rag was informed yesterday (Feb 3) that local business Falling Sky Pottery will be donating $150 to the OB Library. A local family, the Shumways, had pledged to match that amount. All these generous folks deserve our community’s thanks. Good to know that the city is at least seeking community input. Let’s not squander the opportunity to keep our libraries open and thriving. Utilize the libraries and attend the Public Hearings! oh yeah, the city is seeking community input….so when they announce the cuts THAT ARE ALREADY WRITTEN INTO NEXT YEARS BUDGET (OB Library to be open TWO days a week)…the mayor can smile and say “that’s the best we can do”. this CAN be changed–since the budget won’t become “public” for another two months–but it requires ACTION. 1) EVERY community group (Town Council, PTO, Main Street, Boy Scouts, etc) needs to go on record IN WRITING saying that the OB library MUST be open at least five days a week. 2) DON’T let the Mayor’s cronies divide us; every library is important. They’re lurking around making snarky comments about OBcians being TOO LAZY to walk to the Point Loma branch. 3) DO show up at the hearing for our district: Wed, Feb 25, 9am-noon, City Council Committee Room. Let’s support keeping ALL libraries open, with no budget or hours cuts for any libraries! I just wanted to give you a heads up… if you go to either of the two remaining community input meetings, get your speech down in writing before you go up to the podium to speak. Try not to repeat what others have said before you. If you have an actual suggestion to help balance the budget that’d be great. We’re not looking for any staff cuts, please be sensitive with the suggestion of using volunteers in a way that would take city jobs away from people who have often gone to school or trained for their jobs. We love volunteers, really, but hey… we don’t want them to replace the work force. Try to also be sensitive when discussing the pension mess. I’m a city employee. I don’t pay into social security. I have a pension. I am nowhere close to belonging to Carl DeMaio’s $100,000 Club. Most of the decisions that have to do with city employees’ paycheck and/or pensions were not decided by the employees. I think annagrace is supposed to write something to let you guys know the priorities for the next two meetings. Please attend if you can. Your presence would mean so much to those that would love to keep their libraries and rec centers intact! Now… go out and do your OB thang!!! Woo hoo!